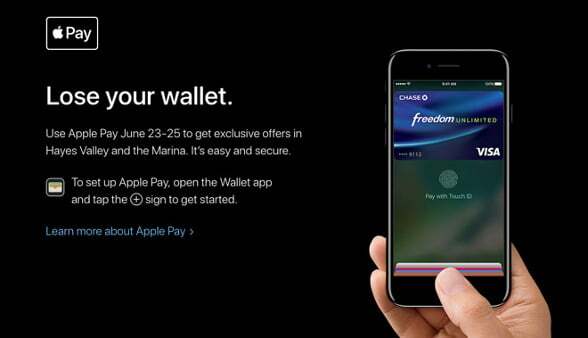 US consumers will be given exclusive offers and discounts on purchases when they choose to make a payment using Apple Pay in stores across the Hayes Valley Shopping District and San Francisco Marina as part of Apple’s Lose your Wallet promotion. The promotion will run from June 23 to June 25 and will include some 20 retailers across Hayes Valley, including Aether, Blue Bottle Coffee, Double Decker, Welcome Stranger and Maker Moss, and 16 retailers in San Francisco Marina, including Benefit, Peet’s Coffee, Marina Deli and Ghirardelli. Offers include discounts of up to 25% on purchases as well as free gift cards and the chance to win special prizes. Offers are also being promoted by “exclusive app” partners such as Caviar, PayByPhone, SpotHero and Square. These offers range from discounts to prizes including the chance to win a month of free parking.